When Heavenâs Gate opened, God sent us a little angel. 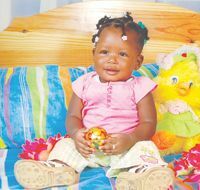 Sheâs no other than Dejonnjay Hoyte, of Coconut Range, Campden Park, who will be celebrating her first birthday tomorrow. Greetings are coming from your mom Stephanie, dad Dillon, grandmother Joan, aunts Shanekar, Nasheka and Nazinga, Uncle Nazon, cousins, Leonie, Kyle and Monita, and the family circle. Wishing you all the best. I love you, my little princess.